Hidden in the dark caves of southwest China, a fragment of Earth's last Ice Age might well survive. Sadly, there aren't any mammoths hiding out in there, but tiny plants might represent a last link to 30,000 years ago. 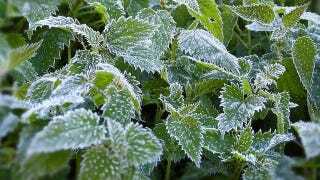 Researchers from the Chinese Academy of Science and the UK's Natural History Museum have identified seven species of nettle from the Guangxi and Yunnan provinces that are completely unlike the tropical vegetation that dominates the region. The nettles are only found in the darkest corners of the provinces' caves and gorges, places where barely any sunlight ever shines. In fact, some of the nettles have to survive on only 0.02% of total available sunlight - you don't find that level of darkness anywhere outside the ocean depths. "They grow at the backs of the main caverns in near-dark conditions. There must be something quite special about their photosynthesis. They probably activate the photosynthetic process very quickly, which enables them to take advantage of very short bursts of light, and they might go for slightly different wavelengths. [They could be] relics of a vegetation from a previous cooler climate that resembled that of the caves." It's that last bit that's particularly intriguing. The nettles don't fit at all with the surrounding plant life, and it's highly unlikely that such unusually specialized plants could ever have evolved from a tropical ecosystem like the one that exists today. To find a possible environment in which these nettles could have evolved means going all the way back to the Ice Age. These nettles and the caves and gorges in which they grow might well represent a last, tiny vestige of the Ice Age that once dominated our planet. There's only one other real possibility, and it's just as dramatic as the Ice Age hypothesis. It's conceivable that the nettles evolved completely independently of the surrounding area, meaning they arose independently in the cave. But the caves are only a million years old, meaning the pace of such evolution would have to be extremely fast. This would then be a great example of rapid evolution, making it one of the fast evolving sets of species we've ever observed. Either way, these are some seriously remarkable nettles, which is a sentence I don't get to say nearly as much as I might like. Phytotaxa via New Scientist. Image by Permacultured on Flickr.